Students presenting their displays at the Frazier History Museum. 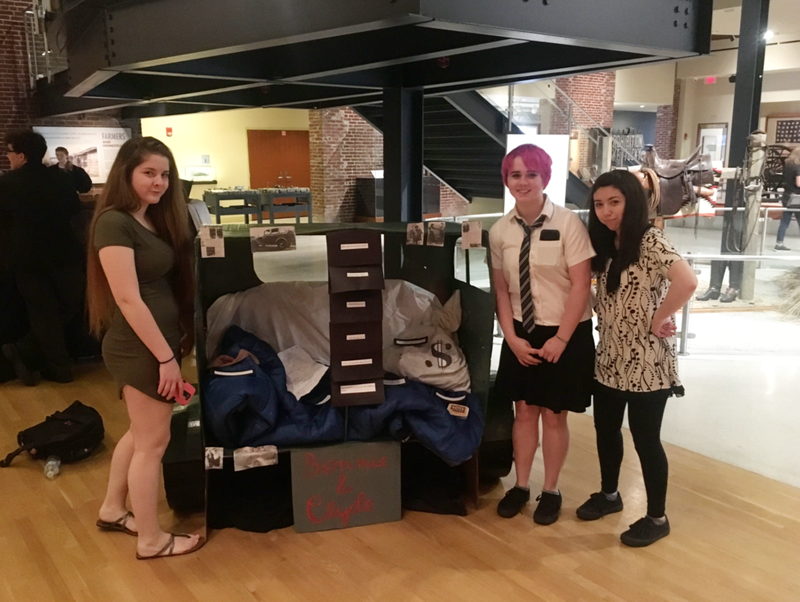 Project Description & Content Topics Addressed: Students create museum displays around the theme of corruption and controversy in United States history. They must choose a topic that fits this theme, and create a display that informs the viewer of the topic, and analyzes the impact the topic or event had on US history and the lasting impact of the topic or event to today. Displays must meet size requirements, and are vetted by a group of community partners. Displays that meet the standard noted by the rubric are taken to the Frazier History Museum in Louisville, KY to be viewed by elementary school students. Each display must include an interactive element that draws in the viewer. Content topics include the Vietnam War and Pentagon Papers, Watergate, Prohibition, the Dawes Act, etc. In conjunction with their research display curation, students will read the novel 1984 and analyze its message about corruption and the government on citizens. Written Communication – articulating content and analysis on historical events through professional and concise labels. B. Driving Question: What impact to corruption and controversy have on citizens of the United States? Benchmark 1: Initial Research-Students complete research on all topics, and then are able to submit their top 3 choices based on interest from the initial research assignment. Benchmark 2: Topic Deep Dive -Students become experts in their own topic. Benchmark 4: Materials check/begin building-Students are required to begin bringing in materials and building their display. Benchmark 5: Labels-Students attend a mandatory labels workshop with resources provided by the Indiana State Museum to understand and meet the requirement for labels on the display. *Students will attend skill and content workshops throughout the project. E. End Products: The final deliverable is the completed display that depicts the topic or event in a professional way, including the three different kinds of labels that effectively tell the story and inform the viewer of the topic. Frazier History Museum: Hosts our students, requests the tasks of them, brings in elementary school students to view displays. Authenticity & Relevance (Real-World Connections, Applied Learning, Active Exploration): The students analyze corruption and controversy in the United States, and identify its impact on the American people, lasting effects of historical events on today, and the development of the relationship between the government and the people. They address this issue by curating museum displays that are set up in the Frazier History Museum in Louisville, KY. The museum asks our students to create an exhibit for them based on the theme of Nefarious Deeds – corruption and controversy in United States history. They choose their topic, do research, and become experts on that topic in order to understand and exhibit the impact of corruption on the United States. They then display their work at the Frazier History Museum for a group of elementary school students as a teaching opportunity. Inquiry: Students do research on what makes an effective and appealing museum display. They are able to express their knowledge in any way that meets the requirements for the display, which include some size restrictions due to space at the museum. Students can bring in their own materials, build the display, or use whatever method they see fit to get their ideas across through artifacts and labels. Students are given a list of acceptable topics, but may also propose other topics that fit the theme of “Nefarious Deeds” for approval during the initial research process. The rubric is vague enough to allow for various means of representation in the final display. Student Voice & Choice: After completing an initial research assignment, students are allowed to request their top 3 topic choices based on their interest in the topics. They are guaranteed a topic in their top 3 choices, which allows for students to engage with a content they are interested in. They are also allowed to propose a topic idea that is not included in the initial research based on their interest and can propose that as a topic for the project. Students are able to create their displays in any way they see fit in order to meet the requirements of the project.